In December 1947, in a landslide victory, novelist Romulo Gallegos became Venezuela’s first democratically-elected president. To celebrate his inauguration in February 1948, poet Juan Liscano came up with the idea of a mounting an ambitious spectacle in Caracas that would bring together the most important folk traditions in the country. The two-hour show, held in the Nuevo Circo bullring in the centre of Caracas, was called "A Festival of Tradition: Songs and Dances of Venezuela." More than 500 dancers, singers and musicians were brought to the capital by plane, bus, boat and mule. For the first time, Guajiro Indians from the deserts of Zulia State were to perform their sacred dances alongside Afro-Venezuelan drummers from the Caribbean coast. And there was more: foot-stomping Joropos from the Llanos, Chimbangueles in honour of the black saint San Benito, and the Dancing Devils of San Francisco de Yare. At first Liscano couldn’t get the Devils of Yare to attend: "I convinced them with the argument that we were doing this festival to show the foreigners that were coming that the Devils of San Francisco de Yare knew how to dance, something which they doubted." 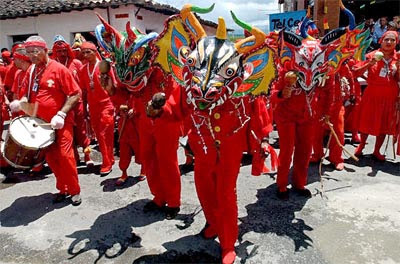 More significantly, Education Minister Luis Beltran Pietro Figueroa, sent yards of red material so that the Devils could make new costumes for the event. So this was the first time in their history that the Yare Devils were all dressed in red. Before that, the arreadores (in charge of keeping order) and the cajeros (drummers) would have worn white suits and the other devils would have made do with bright outfits made from colourful patches taken from old clothes. But it wasn’t going to be easy for Liscano to get the Devils to perform. Nowadays it takes just over an hour to drive the 78 km from Caracas to Yare but for the 35 members of Yare's Devil Dancing Society who made the trip in 1948 it took two days by mule. This was the first time any of them had been away from home and when they arrived some of them had second thoughts. The Devils had only ever danced on the Feast of Corpus Christi and were wary of performing without the usual preparations: attending mass and having their masks blessed by the local priest. To convince them Liscano had to arrange for them to attend a morning mass every day they were expected to rehearse and performing. But he forgot to get permission from the mayor’s office. The members of the cofradia went to their first mass in Caracas in a church in El Valle, and they came dressed for Corpus Christi in their full devil-dancing regalia. As the priest held aloft the Holy Sacrament they took their cue and began a frenetic dance in the entrance of the church. The noise of the drums and maracas was so loud that it brought the local police, who promptly arrested the Devils for disturbing the peace and wearing masks outside of Carnival. Fortunately, they were soon released. The Devils had another request for Liscano: "…one day they came to tell me of their greatest desire: to see the sea before returning to their home town." It’s hard to understand the isolation of small towns like Yare back in 1948, but none of the Devils' had ever seen the sea before, and their bus trip to Macuto, on the central coast, was a revelation. Liscano writes in his book Sacred Fires: "… when they discovered that great blue stain, under a wide, cloudless sky, they were seized with a kind of ecstasy, a profound feeling of respect for majestic Mother Nature who had made such beautiful things." "… they entered the water in silence, in a state of reverie, and some of them plunged their hands into the water in a sort of ritual gesture." The Festival of Tradition was a huge success. So many people turned up on the opening night that it had to be extended for four more nights. In total 25,000 people watched the show. It was an event the like of which Venezuela had never seen and was never to see again. The party was soon over for Romulo Gallegos too, on 24 November 1948 he was ousted in a military coup and forced into exile for the next ten years. For the Dancing Devils of Yare, however, it was just the beginning. Soon, the annual Corpus Christi celebrations in Yare would become one more attraction for tourists to visit, like the mountains of Merida, the spectacular Angel Falls and the blue Caribbean waters that had so captivated the Devils.